Challenges: Diminishing water levels in aquifer by groundwater abstraction, Frequent drought conditions, Risk of water & soil contamination. The Mancha Oriental area is characterized by having a relatively flat surface with an average height of 650 m. It is located in the South-East of the Iberian Peninsula, at 39.7N-38.6N and 2.53W-0.9W, in the Jucar River Basin. It occupies about 10.000 km² of which more than 500.000 ha are devoted to agriculture. Semi-arid climate with an annual precipitation below 350 mm and an evapotranspiration above 1200 mm. Its main characteristic is a high variation between seasons and between years, according to the Mediterranean-Continental type. The averages temperatures vary between 5 ºC on January to 24 ºC on July. The oscillation between dry and wet years ranges from 124 mm to 750 mm. The total population is close to 400.000 people and the biggest settlement are Albacete (170.000 inhabitants) and La Roda (16.000 inhabitants). The soil is shallow with a limestone bedrock. It is highly variable with sandy loam, loam and clay loam texture, often stony but easy to cultivate and quite fertile under appropriate agronomic management. The area features mainly medium to large farms with 70% of the farms being larger than 100 ha. Around 10% of the farms practice organic agriculture and 7,5% conservation agriculture. The water for irrigation is mainly supplied by groundwater (93%). Agriculture is the largest water consumer summing up to 95% of the water demand, with a share of 89% of the supplied water being used by individual farmers and 6% by water user associations. 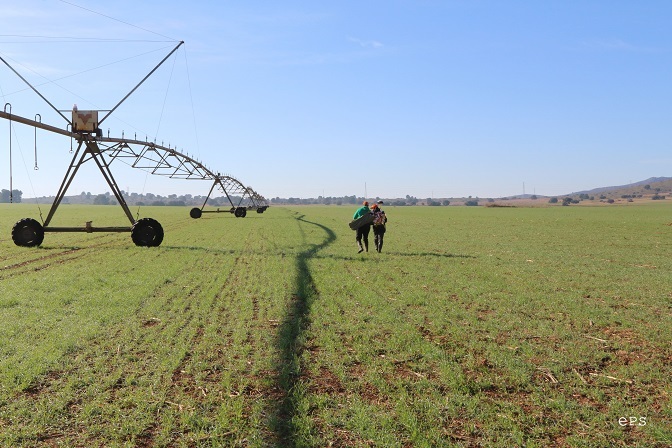 Regarding irrigation technology only pressurized systems are used, in annual crops: central pivot (75%) and other sprinkler systems (25%), in woody crops: drip irrigation (100%). The Mancha Oriental Aquifer is a large groundwater body that is connected to the Jucar River in terms of drainage and recharge. The groundwater level lies at a depth of 60-200 m. The aquifers is threatened by over-extraction and feature no “good status” as defined in the EU Water Framework Directive. The biggest part of the area is designated Nitrogen Vulnerable Zone, the amount of applied nitrogen is restricted.